A train crashed into a grain truck just west of Mitchell, Nebraska, on October 20th. 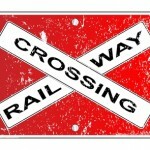 The train was eastbound when it collided with the truck at a county road crossing. There were two people aboard the truck at the time. One of them was killed in the crash. The other person suffered serious injuries and was flown to a hospital. Found in section: Train, Trucking, U.S.